Waikīkī is a ‘built’ beach. Between 1913-1919, the majority of Waikīkī had seawalls; they were placed to protect roadways and new buildings. The beach was lost fronting Kūhiō and Queen’s Beach. In 1927, the Territorial Legislature authorized Act 273 allowing the Board of Harbor Commissioners to rebuild the eroded beach at Waikīkī. By 1930, the Board of Harbor Commissioners reported on construction progress, which included 11 groins along a portion of the shoreline. 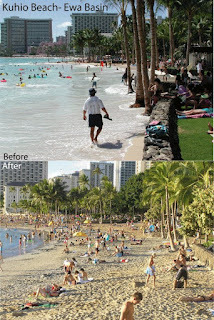 Then, they started adding sand to Waikīkī Beach. Reports from the 1920s and 1930s reveal that sand was brought in to Waikīkī Beach, via ship and barge, from Manhattan Beach, California. As the Manhattan Beach community was developing, it found that excess sand in the beach dunes and it was getting in the way of development there. At the same time, folks in Hawai‘i were in need for sand to cover the rock and coral beach at Waikīkī. Kuhn Bros. Construction Co supplied the sand; they would haul the sand up from Manhattan Beach, load it onto railroad cars, have it transported to the harbor in San Pedro and shipped by barge or ship to Hawai‘i. Later, Waikīkī’s sand was trucked from various points around Hawai‘i including O‘ahu’s North Shore - in particular, Waimea Bay Beach, a sand bar off the town of Kahuku and Papōhaku Beach on Moloka‘i. Reportedly, before sand mining operations removed over 200,000 tons of sand at Waimea Bay to fill beaches in Waikīkī and elsewhere, there was so much sand that if you would have tried to jump off Pōhaku Lele, Jump Rock, you would have jumped about six feet down into the sand below. A formal application for a cooperative study regarding beach erosion in Waikīkī was made by the Board of Harbor Commissioners, Territory of Hawaii in 1948. The intent of the Waikīkī Beach Erosion Control Project, which was the responsibility of the Army Corps of Engineers, was to increase beach land, improve access to beaches, and to prevent further erosion of beach sand. The Waikīkī Beach Erosion Control Project was initiated in response. This project initiated what would turn out to be a 50-year series of attempts to restore Waikīkī Beach. Since 1929, about 616,500 cubic yards of sand have been used to enlarge and replenish Waikīkī Beach between Fort DeRussy and Kūhiō Beach, but every year more erodes away. Little sand has been added since the 1970s, according to the DLNR. When I was at DLNR, we initiated a demonstration project to move near shore sand back on to the beach. In 2006, DLNR spent $500,000 to siphon 10,000 cubic yards of offshore sand – this was the largest replenishment effort of Waikīkī’s beaches in more than 30 years. It worked; then, a larger project was implemented. Early in 2012, a larger-scale replenishment project pumped sand from 2,000 feet off Waikīkī to fill in the shrinking beach. The 2006 demonstration project and recent (2012) larger scale replenishment were really recycling projects, because the sand now settled offshore was brought in years ago to fill out the beach. 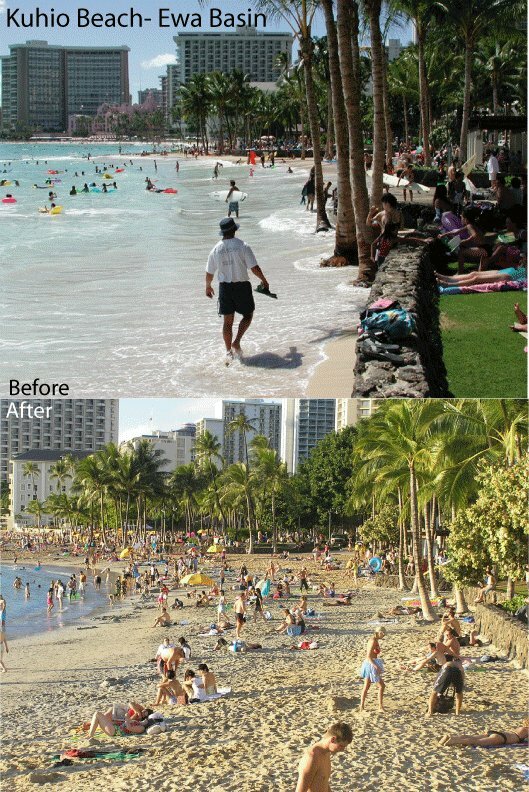 The image shows the before and after of the 2006 beach replenishment demonstration project we conducted while I was at DLNR. In addition, I have included other images of Waikīkī over the years, as well as other images of the replenishment projects of 2006 and 2012 in a folder of like name in the Photos section on my Facebook page.